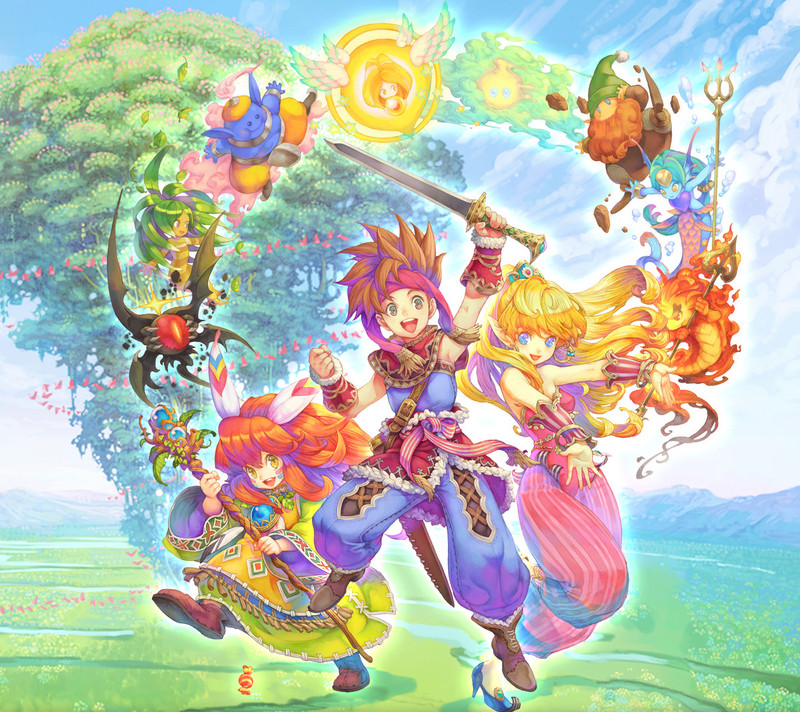 The Gay Gamer: Happy ever-so-slightly belated (20th) anniversary, Secret of Mana! Happy ever-so-slightly belated (20th) anniversary, Secret of Mana! On Aug. 3, 1993, one of my favorite games of all time hit store shelves across Japan. The game in question, of course, was Seiken Densetsu 2 (aka Secret of Mana). Those of you who weren't glued to an SNES growing up may not know much about this awesome 16-bit title, so here's my horribly brief description of it: take three parts Final Fantasy (music, graphics, general RPG aspects), two parts The Legend of Zelda: A Link to the Past (real-time battles, top-down perspective) and another two parts "WTF in a good way" (the ability to play as three characters at once, plus the game's "Ring Command" menu system) and you have a loose approximation of the gem that was and is Secret of Mana. I put many an hour into this expansive adventure as a teen--after spending nearly as much time drooling over early screenshots of it (back when it was still known as Final Fantasy Adventure 2 in the west) in DieHard GameFan, Electronic Gaming Monthly and other gaming rags of that era. Sadly--and oddly, given what I just said--I haven't gone back to it for some time. Maybe I should consider doing just that after my Animal Crossing: New Leaf obsession fades a bit? Do any of you have fond memories of this colorfully charming (as well as challenging) title? If so, I'd love to hear about them in the comments section below. Some of my friends did a playthrough (I don't know how far they got) over this weekend--they didn't say if it was a special anniversary event, though! Waaay back in the day I played through this with my brother and a neighbor, we had the multitap so we were able to go through the whole thing with three players. I have to say I remember that we did that more than I remember much about the game! I do wish it was a bit more Zelda-like (I found the combat "action" to be kind of weak) but it was a lot of fun! Anyway, I understand not loving the combat, although I personally loved it. I liked how it was a little bit Zelda, a little bit Final Fantasy V/VI (what with the ATB-like meter that had to fill up before you could attack effectively again). I bought it for the Wii Virtual Console, but I never got very far into it. I should give it another shot. That's the kind of game I'd love to have on the Wii U so I could play it in bed with the GamePad. But OMG, I played Final Fantasy Adventure to death on the Game Boy. I liked that they remade it for the GBA, but I keep hoping the B&W original will turn up on the 3DS eShop. Ah, yes, it definitely would be a good game to play in bed using the Wii U GamePad, Terry. Also, I loved the first, GB-based FF Adventure, too. I also loved the FF Legend games. Have you played any of those? Yes. I beat the first one way back when, and I still have the second and third games somewhere in my collection. Will forever love this series! Was so disappointed when Seiken Densetsu 3 never got localized back in the day... but yeah, such a charming series and helped foster my love for jrpgs. Oh man.. This was one of my most favorite games back in the day. I had soooo much fun playing through it. I had to go solo for most of it with a friend only jumping in here and there. I then miss-place the cart right as I got to the end dungeon. Couldn't find the bloody thing till 4ish months later. Did a happy dance like you wouldn't believe and proceeded to kick the Dark Litch's and Mana Beast's behinds into next week. Great game. They've never really top it sense then. Though the "Legends of Mana"(PSX) and "Sword of Mana"(GBA remake of Seiken Densetsu 1) did come close. Oh, I was saddened by SD3's lack of a localization, too, DDD. Total missed opportunity on the part of Squaresoft, if you ask me. I love that damn damn drum has been your handle ever since, BTW. I remember actually writing to Squaresoft since it was located in Redmond, Washington at the time, asking for both SD3 and FFV to come to America =D haha! Glad to hear you love this game, too, Matt! Although I own a copy of Legends of Mana, I've yet to play it. Isn't that sad? I've never owned or played Sword of Mana, although I've heard mixed things about it. Sounds like you like it well enough, though? It definitely was frustrating from time to time, Michael, but like you said, I appreciate the nuance of it for the most part. I used to play with my brother, and somehow I always got stuck as the Girl. Maybe that's why I ended up gay, lol. In all seriousness, my brother kept hogging the Sprite, so it was the Girl or Boy, and everyone knows the Boy is useless. At least Girl finally came into her own once she got Lumina. Anyway, yes, I know about the glitches. Last time I played, I got stuck during a battle somewhere because of one. In fact, I think that's what caused me to give up on that particular playthrough (if memory serves). Ha ha! Looking back, it really set a precedent for me. To this day I still enjoy playing support in multiplayer games, either healing or giving buffs. BUT, I can't play a support character that doesn't have at least one awesome offensive spell like Lucent Beam. Hehe, yeah =) and great you mentioned the old gaming mags, because I believe it was either EGM or Gamepro where they mentioned writing to the Redmond offices of Squaresoft! Oh, yeah, that's probably where I got the idea, too. I doubt I still have it, but for a long time I held on to the written response I got from someone at Squaresoft's OS offices. If I can remember, I'll see if it's still tucked away somewhere in my old bedroom when I go home for Christmas. Legends is fantastic. Not the same game at all. But a deep, and bloody gorgeous, experience all to it's self. Sword is fun. It has issues, but the positives out-weigh the negatives in my on opinion. Oh, I know Legends is gorgeous. I think I've avoided it until now because I've read that it's less of an RPG and more of a hack-and-slash? Still, I should give it a try. Believe it or not, I've never played Secret of Mana! Do you know what would be the best way to pick it up now? Actually, I DO believe it, Anne--but only because you told me long ago that you haven't played a ton of games from this era. As for the best way to pick it up now: your only real options at the moment are the iOS version or the Wii Virtual Console version. Hopefully it'll hit the 3DS/Wii U eShop at some point, too, but I'm not sure that'll happen anytime soon. And then, of course, there's always the emulation route! I picked it up randomly at Wal Mart when I was...oh...11? I wasn't sure, but I figured I'd give it a try. It's one of my favorite games of all time. I played as the boy until I unlocked the sprite. Then I spammed magic until bosses were crying for mercy. I finally beat it without using the game genie a few years ago. Worth every minute of grinding for the satisfaction of it. Once, when fighting the mana beast at the end, the boy got knocked off the platform and disappeared. About twenty minutes of hopeless fighting later, his life bar disappeared. It was the strangest thing. I wrote to Nintendo Power about it, and they said they'd never heard of such a thing happening. I still remember the all-nighters with friends trying to finish the damn thing...Spiky Tiger had me stuck for SO LONG. I love hearing other people's memories of old games like this one. Rekindles my own, similar memories, I guess. BTW, I love that you wrote to Nintendo Power about your situation. Strangely, I don't think I ever wrote them -- and I definitely was a letter-writer back then! I played 90% of it alone, too...but the parts I played with friends usually went like this: "HEAL! HEAL! NO! THE OTHER ONE! DAMN IT! USE A CUP OF LIFE! HEAL! HERE...I'LL HEAL! YOU JUST KEEP HITTING HIM WITH GEM MISSLE!!!" Haha, that's right, I did tell you that ;) Secret of Mana is definitely one of the games I'd like to go back to, though. Maybe I'll hold out for a 3DS/Wii U eShop version! Or yeah, just go for emulating if I have a spare moment.